What do all the numbers mean in my portfolio's 1W, 1D or 1H overview? Let's take an example here of Red Pulse (RPX). I have selected Kucoin as the exchange and RPX/BTC as the pair. BTC is the base pair here. The price per coin i.e. RPX/BTC rate is taken directly from the exchange and displayed if in BTC view mode or is converted using the exchange's BTC/USD or BTC/USDT rate to display the price per coin in USD. If the exchange selected does not have a BTC/USD(T) pair then the BTC/USD from coinmarketcap.com is used. 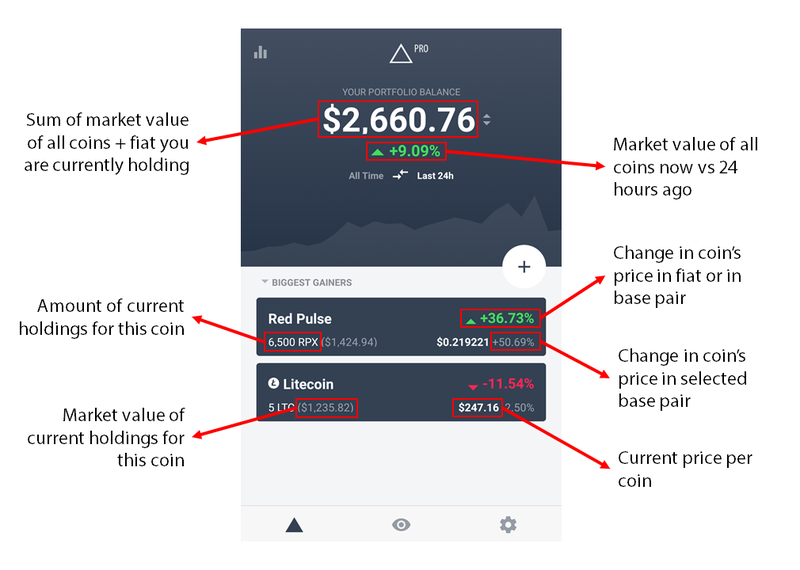 The market value of your current holdings is simply the price per coin times the amount of current holdings.